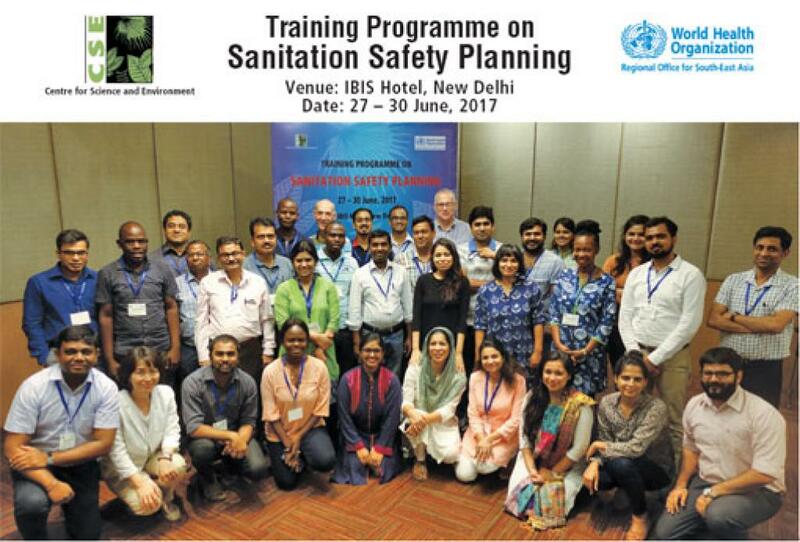 Centre for Science and Environment (CSE), India in collaboration with Word Health Organisation (WHO) conducted a four day training programme on “Sanitation Safety Planning (SSP)” from 27-30th June, 2017. 30 practitioners from India and abroad (Rwanda, Tanzania, Bangladesh, Kenya and Ghana) participated in the training programme to learn about SSP as a tool that provides a structure to bring together actors and stakeholders from various sectors to identify health risks in the sanitation systems and agree on improvements and regular monitoring. On Day 1, the opening session of the training was presided over by Mr Sumit Kumar Gautam where he told the participants about CSE and the programmes CSE has been working on. It was followed by an introductory session by Mr Darryl and Mr David (trainers- WHO) and an overview about the field visit by Mr Shantanu Padhi. Post lunch, the participants were taken for a field visit where a live demonstration of desludging and disposal of faecal sludge was done. Participants were also taken through the whole FSM value chain in Dwarka, showcasing the sanitation/public health loopholes. The day ended with a reception dinner which was attended by all the trainers and participants. From the next day the participants started working on the SSP with the field visit in context. They learnt how to establish priority areas and system boundaries for SSP as well has describing the sanitation system in which they will be working in. Participants were involved in various interactive exercises where they mapped the system, characterized waste fractions and then identified potential exposure groups. The participants learnt about the potential hazards along the FSM value chain which involved- identification of hazardous events, exposure routes and estimation of risks from previous day’s sessions. Module 5 and 6 introduced the participants to the detailed deliberation on the screening of available options to minimize the risks from potential hazardous events. This was followed by the understanding on how to select the most appropriate options to minimize the risk along with its effectiveness and priority [Long medium or short term]. The trainers also exposed the gathering to WHO guidelines on the use of wastewater in farm lands, how to minimize the risks and what type of irrigation [restricted, unrestricted] should be deployed based on the part of crop to be consumed and how [eaten raw or cooked]. The event concluded with good and constructive feedback along with sharing of the experiences by participants and certificate distribution. All participants unanimously agreed on the usefulness of the SSP tool, and proposed their plans to integrate same in their ongoing activities. To establish a pool of national and international sanitation players who have in-depth understanding of Sanitation Safety Planning (SSP) key concepts and principles.